This weekend marks the first weekend of church worship services that will be live-streamed onto iPhones. Assuming all 5 services would be live-streamed, services atÂ New Hope Christian Fellowship will be live-streaming on Saturday 7/4 at 5 & 7pm and Sunday 7/5 at 7, 9 & 11am, Hawaii Time. Being translated, that would be in Pacific Time: Saturday 8pm + 10pm, Sunday 10am + 12pm + 2pm. New Hope also has anÂ internet campus with streaming video and an interactive online community. 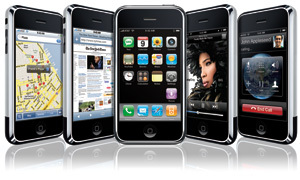 Less than two weeks after the release of Apple’s iPhone 3GS and iPhone 3.0 update, Honolulu-based New Hope Christian Fellowship (http://www.enewhope.org) has announced that it will begin streaming its weekend worship services live to iPhone and iPod touch users. Leveraging standards-based HTTP streaming technology, New Hope will deliver high quality video over either a Wi-Fi connection or other carrier network, providing for a truly portable experience. After successfully testing the service this past weekend with hundreds of users, the church is now planning to offer the live streaming video of its services to all iPhone and iPod Touch users starting July 4th. The church currently streams all five weekend services live on its website for computer users and created the streaming for the iPhone as a free service for those who may not have access to a computer. The live stream of New Hope’s Services will be available on their website atÂ http://www.enewhope.org beginning July 4th. The live stream requires an iPhone or iPod touch with the 3.0 software update and an active Internet connection. Started in 1995, New Hope Christian Fellowship Oahu is one of the fastest-growing churches in the nation according to “Outreach Magazine,” with over 12,000 people in regular attendance at 6 locations. “Outreach Magazine” also named New Hope as one of the most influential and innovative churches in the United States. 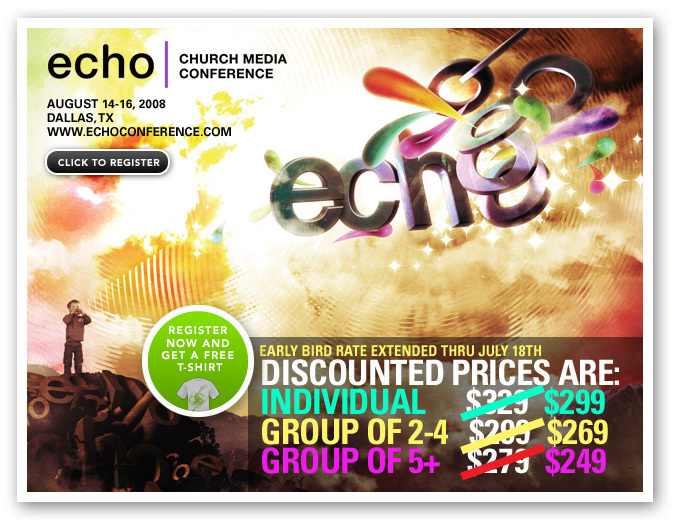 ECHO Church Media Conference is a month away. Are you going to be there? 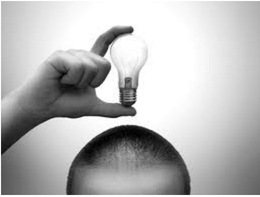 You can and you should – AND you can still do it at the early-bird rate. I’ll be there and so will so wonderful friends of mine. Have you seen the list of speakers? WOW! I think this would be great for worship leaders and senior pastors, as well as my tech friends. And seriously, any excuse to come to Dallas is all good. Some people I know attending the conference are coming over to Bent Tree for a tour. If you are coming or are thinking about coming, let me know, and we’ll set up a time for you to swing by and I’ll personally show you around. I hope to see you at ECHO! In other news, the new Apple iPhone sold over 1 million units in just 3 days! Are you kidding me??? Wow! Hey, speaking of ministry, sharing, generosity, God blessing you, etc., etc. – IF you already had an iPhone and just purchased the new one AND are wondering what to do with your old one… I would be glad to use it (for ministry purposes, of course). Holla! The wait is over. As the web is buzzing with reports of the new iPhone 3G and iPhone 2.0 update, weâ€™re adding to the excitement with the debut of a Bible App for the iPhone, powered by YouVersion.com. The ease of use youâ€™ve come to expect from YouVersion.com now fits in the palm of your hand. Weâ€™re thrilled to launch this new application that iPhone and iPod Touch users will be able to download for free. Itâ€™s called the Bible App and itâ€™s available now from Appleâ€™s built-in App Store. * Now that’s cool. Well done LifeChurch.tv! You can sign up on iTunes HERE or read more about it HERE.